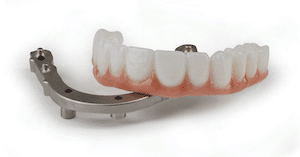 This denture system utilizes individual crowns in a choice of ceramic materials, including high-strength zirconia, e.Max® or even layered porcelain, on an award-winning AccuFrame or AccuFrame Plus titanium framework. The result? Guaranteed fit, superior appearance and long-lasting performance. 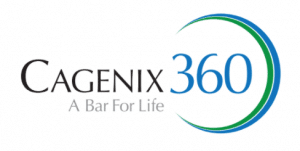 A cost-efective hybrid denture solution, the Cagenix 360 offers easy repair and placement (in as little as one visit) and a lifetime framework warranty. AccuFrame IC restorations utilize individual crowns in a choice of ceramic materials, including high-strength zirconia, e.Max® or even layered porcelain, on an AccuFrame titanium framework. The AccuFrame framework is for life! The Cagenix AccuFrame IC (Individual Crown) System is removing the price barrier to improved look and performance of your fixed-hybrid cases — and making it possible for you to offer the highest quality full-arch restorations at truly affordable prices. AccuFrame IC restorations utilize individual crowns in a choice of ceramic materials, including high-strength zirconia, e.Max® or even layered porcelain, on our award-winning AccuFrame or AccuFrame Plus titanium frameworks. The result? Guaranteed fit, superior appearance and long-lasting performance. Stronger than traditional fixed-hybrid restorations: Virtually eliminates tooth wear and breakage. Dentures are a way to replace a number of missing teeth so that functionally, you can chew your food and have a nice smile. However, since dentures sit in the mouth on top of the gums there are no tooth roots to anchor and stimulate bone growth and strengthen the jawbone. This leads to bone loss, receding gums, changes in the shape and profile of one’s face as well as periodontal disease. In addition to the physical changes they cause in your face, dentures often need to be resized, they can cause sores in the mouth from friction, they slip and can impair your ability to speak clearly. 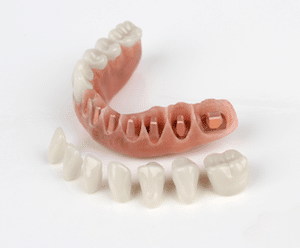 A healthier alternative to traditional dentures is the Implant Supported Denture. This is a combination of a number of implants surgically implanted into the jawbone (good for bone stimulation and growth) and a denture which can be removed and cleaned. This option prevents bone deterioration that can lead to periodontal disease. Patients who go this route also experience an easier time talking and chewing. In addition to these benefits, since there is no bone loss in the jaw there is no slippage and the denture does not need to be resized.